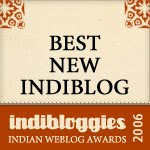 Saffron Tree: Where is the Green Sheep? I always find hand-picking books for babies and toddlers very interesting, and challenging. While its bulls eye most times for the older age groups with the knowledge of their acquired likes and dislikes, it could be more of a gamble with the unknown, for the fries. The eye scans for something more than instructional concept books, for a gush of creativity that makes us hopeful of reining in the wandering little mind. Texture or bold colors, sounds or pop-ups, pulling tabs and pushing buttons often come to the rescue. None of the above physical or mechanical attractions in this book. And yet it can hold the child in rapt attention. What is it that does the trick? Repetition - a binding word that puts the child in the comfort zone and belts him up for the ride. The "hiding" game intact. The confluence works like magic! All said, it is still a concept book. Here is the bath sheep. And here is the bed sheep. Clever, I tend to think. Clear ink-and-watercolor illustrations keep things simple for the young. Appropriately placed, pictures of different sheep - scared sheep, far sheep, moon sheep and the like support the text further along. Not to forget the adorable portrayals of the sun sheep on the beach or the train sheep peeping out the window. The use of opposites, colors and patterns add value, and rhyme sustains the momentum. Blank white pages periodically appear questioning But where is the green sheep? and the excitement mounts to find our missing friend. The finale is when the anticipation builds in the couple of pages leading up to the "eureka" moment on the last spread! And that's when, I'd surmise, the exceedingly satisfying moment for the reader and the listener would also arrive. There is an elaborate writing on Mem Fox's website on how she collaborated with Judy Horaceck on the book and how the book evolved - http://www.memfox.net/green-sheep-secrets.html. The photograph included at the bottom says it all! Here is Judy Horacek's website, http://horacek.com.au/, where her banner includes our colorful sheep friends as well. Amongst other things the back cover of the book also lists the accolades that it has received. 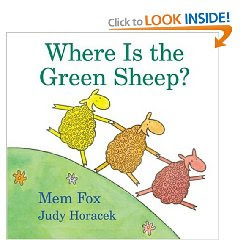 I'd hate for my 20 month old toddler to grow up to discover "Where is the green sheep?" not featured on Saffron Tree! Because that's how much he loves this book...we love this book! Sounds like even the out-of-toddlerhood people around here will like it! u guys shud start a library of sorts!! Most books are sooo tough to buy off the shelf.. :) I love what the book has to offer. I think my 3 year old would like it too! we read this a while back for the older kid...time to try it on the younger one! Sounds delightful, Meera. Reminds me of Who's Hiding which was a fave with Ana (at about 18-20 months)... have to try this one with Og (now a 21-month old). Thanks! Fun pick! Animal board books are a riot and with a rhyme, even better. Enjoyed the review and also, Mem's making of the book. Thanks, M! We had the Sandra Boynton boardbooks that both the girls loved/S still loves, and a slightly offbeat one we got as a gift - So Many Bunnies - (an alphabet and number bedtime boardbook with soothing rhyming text) Was a hit with K. S, still getting used to it.